North Korea’s “Supreme Leader” Kim Jong-un visited a naval base recently to tour a staple of the People’s Navy’s subsea warfare capabilities: a rusted-up, 1950’s-era clunker submarine. 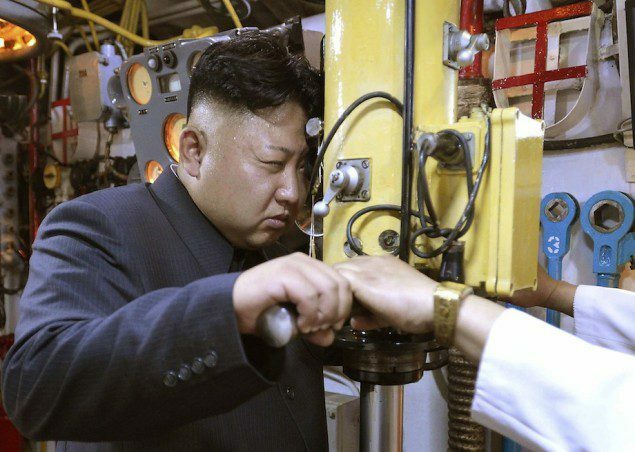 During his visit, the 31-year old dictator took some time to use the periscope, meet with crew and even go for a little cruise, where he had the opportunity to “teach” the submarine’s captain a “good method of navigation”, according to statement from the state-run Korean Central News Agency in Pyongyang. The sub itself is of the Romeo class, which was first built by Russia in the late 1950’s but replaced soon after with the arrival of nuclear-powered subs. North Korea reportedly still has over 20 of the subs that were either purchased from China or built in North Korea, even though the class has been phased out of operations by all international navies.